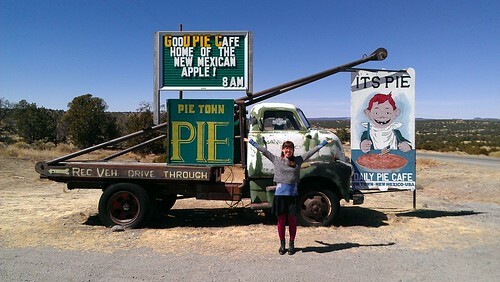 A Pie-lgrimage: Road trip to Pie Town, New Mexico. In the game of life, we all have journeys to take, and pilgrimages to make. And as a seeker of sweetness, I prefer to make mine dessert related. 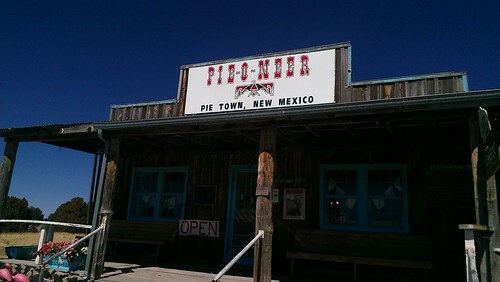 So it should be no surprise to you that it's been a longtime dream of mine to visit Pie Town, New Mexico. Yes, friends, this is a place that actually exists. And this spot in the desert's name was in fact inspired by the classic American dessert. 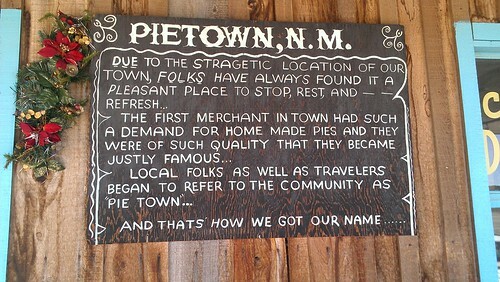 There are several versions of the story of the founding of the town and how we came to be called Pie Town. There may be some discrepancy in dates but these are the basic facts of our story. In 1922 a veteran of WW-I by the name of Clyde Norman filed a 40-acre mining claim for gold and silver along the route of US-60 and a trail set aside to drive cattle to a railhead 60 miles to the east. Although US-60 bills itself as the Nation's first coast-to-coast highway, when Clyde Norman settled here the cattle driveway was the more important route. Norman’s mining claim was not very successful so he opened a small store to supplement his income. He sold gasoline, kerosene and pies made from dried fruit. Some stories say he made the pies, some say that his teenaged niece did. 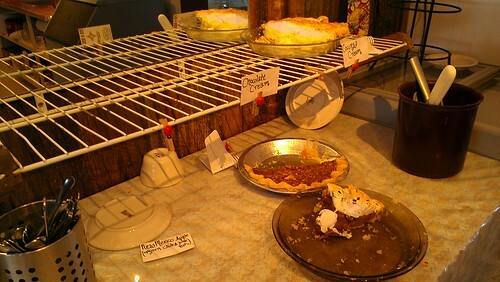 At any rate the pies were a hit with the cowboys on the cattle drives who went out of their way to stop at "Pie Town." In 1924 Harmon L. Craig bought a half-interest in Pie Town from Norman for "one dollar of good and lawful money and other good and valuable consideration." A few years later Craig bought out Norman and became Pie Town's leading citizen. He owned the mercantile store, a Chevron service station and garage, a café and a pinto bean warehouse. Most of the families that settled in Pie Town came from Texas and Oklahoma during the Dust Bowl and established homesteads. The bean warehouse provided local homesteaders a way to market their crops. Mr. Craig helped these families struggling though the Depression by selling land below market value, and by making loans with no collateral and no interest. When it came time to establish a Post Office for the town the Postmaster General thought Pie Town was not an appropriate name, but the local citizens insisted that it was the only acceptable name. In 1940 Farm Security Administration photographer Russell Lee took an extensive set of photographs of Pie Town, including some using the new Kodachrome color film. Those photographs are in the National Archives. Today's residents still have the sense of community and self-sufficiency that sustained the earlier settlers. We enjoy a unique tranquility in one of the few places in the United States where you can still see the Milky Way. 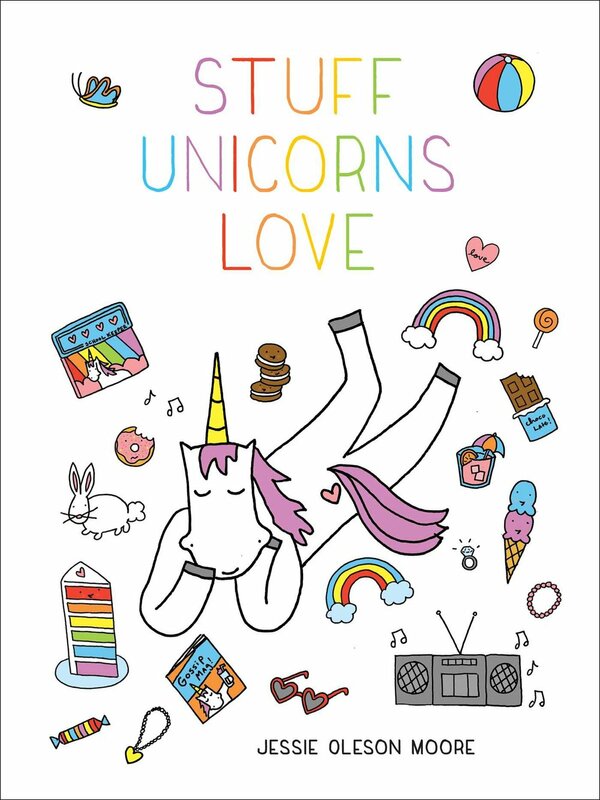 And well, that's true. It's about a 3.5 hour drive from Santa Fe, or a 2.5 hour drive from Albuquerque. Either way, it's a long trip for a town that boasts a main street area of about 2 blocks, and only a small handful of businesses, two of which are pie-centric. One friend asked me “did you really drive all that way for just a slice of pie?”. But to one on a pastry pilgrimage, that's quite enough. And it's also true that this town has played muse to more than me: there's a book called Pie Town which was so popular that a sequel was written, too. Even without that, though, I was delighted to head down there—on Pie Day, no less, 3/14. 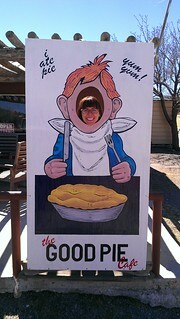 After driving a long-long way, our first stop was the Good Pie Cafe. 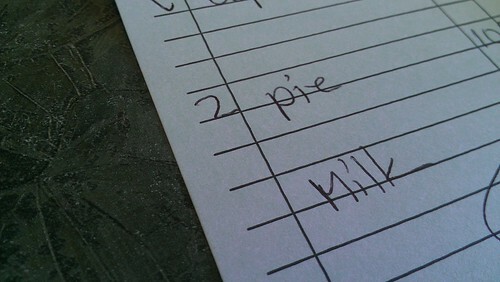 At this cafe they serve a simple diner menu, but Pie is the real focus. 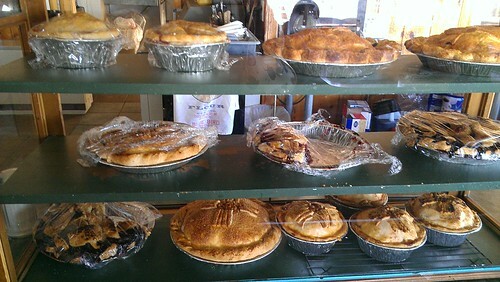 They'll offer several types each day, and most likely their famous New Mexican Apple Pie will be on the menu. 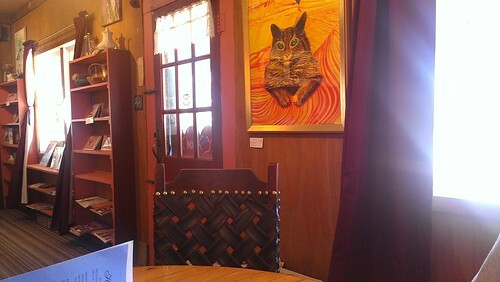 The atmosphere is eclectic and funky, kind of like visiting your uncle who's living off the grid or something. But with pie. It's cozy and quirky. We ordered the New Mexican apple pie and the chocolate pie. It was evident from the get-go that these are not necessarily fancy pies. But the love with which they are crafted is clear, and for me, that made the experience. 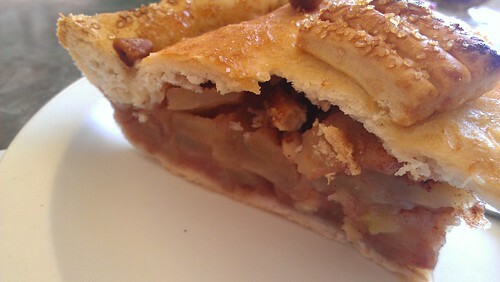 The apple pie was an interesting flavor—the light sweetness of the apples was nicely paired with toasty pinon, and then—surprise!--a little kick from the green chile. It made for a fascinating flavor, and I could definitely see this as a breakfast treat, not so much a sweet at all. Especially with that nice, sturdy and very carb-y crust. That's my type of crust, by the way. I don't like it when pie crust shatters on you. 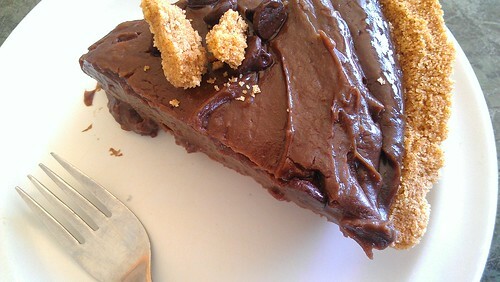 The chocolate pie had a nice flavor, but I wished it had a big fat dollop of whipped cream on top. 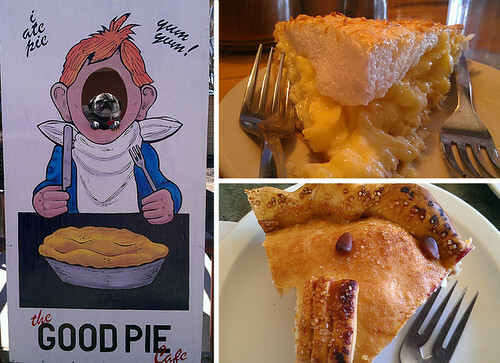 Still, the experience of eating pie in this weird little spot in Pie Town made it all worthwhile. 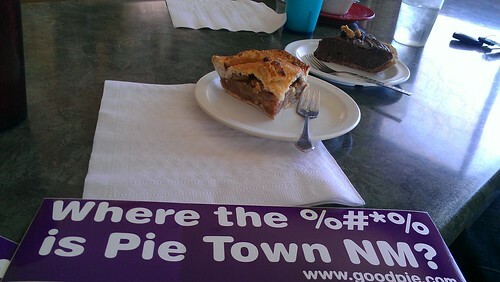 While we were there, we were given stickers as a token of the owner's appreciation of our patronage on Pie Day. We were also told to come back on 6/28, which locals call “Double Pie Day” on which you are welcomed to eat double the pie. What a great day! 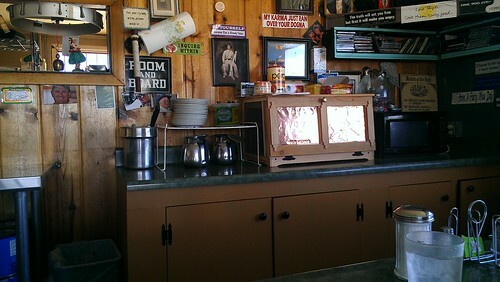 Down the road, you'll find the Pie-O-Neer Cafe. Don't go there on Thursday, or Monday, or Tuesday, or Wednesday, as they are closed—but luckily, it was Pie Day on the Thursday we went, so they were open as an exception. It being pie day and all, the selection was somewhat picked-over by the time we got there—apparently, there had been a big run from students from a nearby college. 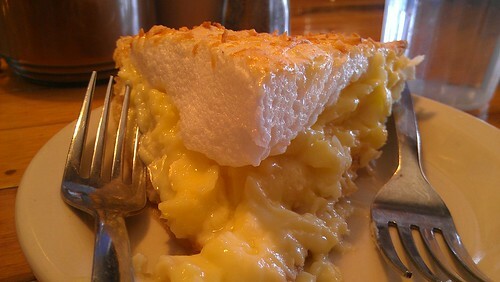 But there was enough for us to enjoy a slice of coconut cream pie with a nice meringue topping. Interestingly, I don't think I have ever tasted coconut cream pie with a meringue top like this before. I found it highly satisfactory. The coconut custard was very dreamy, and the pie crust a flakier variety than down the street. It worked very well together. 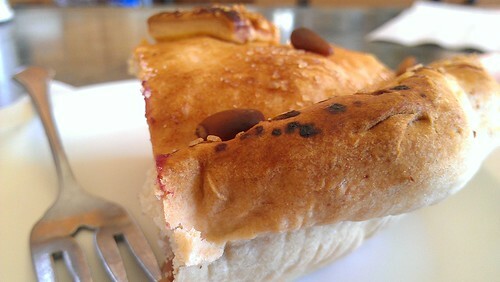 Moreover, I felt that the pies were perhaps more sophisticated at Pie-O-Neer and the atmosphere still quirky but a little bit more grandma's house style. 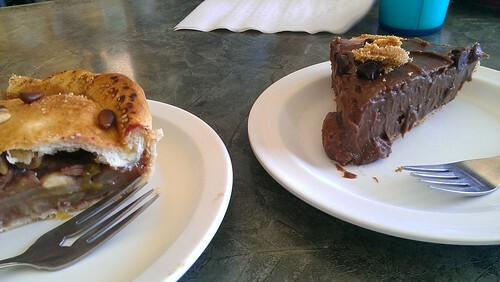 So yes, I drove 7 hours (3.5 hours each way) for some pie. Was it the best pie I've ever had? No. But I call to mind a passage in the classic Donuts: An American Passion in which John T. Edge refers to the act of eating beignets at the famous Cafe Du Monde as being a "rite of passage". While they're not the only friteur in town, he says, there's something to having the experience of eating them there and taking part in that ritual. 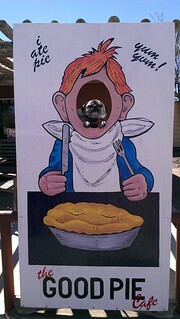 So, that having been said, for the experience of enjoying pie in pie town, what I ate couldn't have been better. 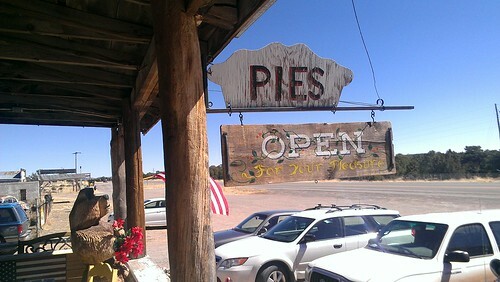 Pie Town, 3.14 Miles from Nowhere. 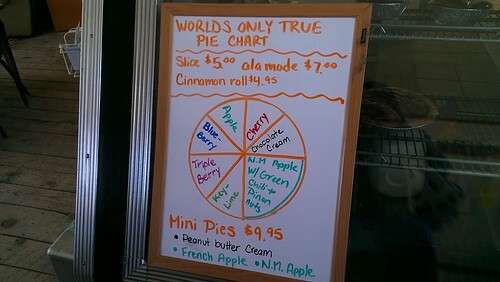 Places to go while you're there: Good Pie Cafe, Pie-O-Neer Cafe, and don't miss the Windmill Museum.